This week's tutorial features our new Lost World dinosaur collection. 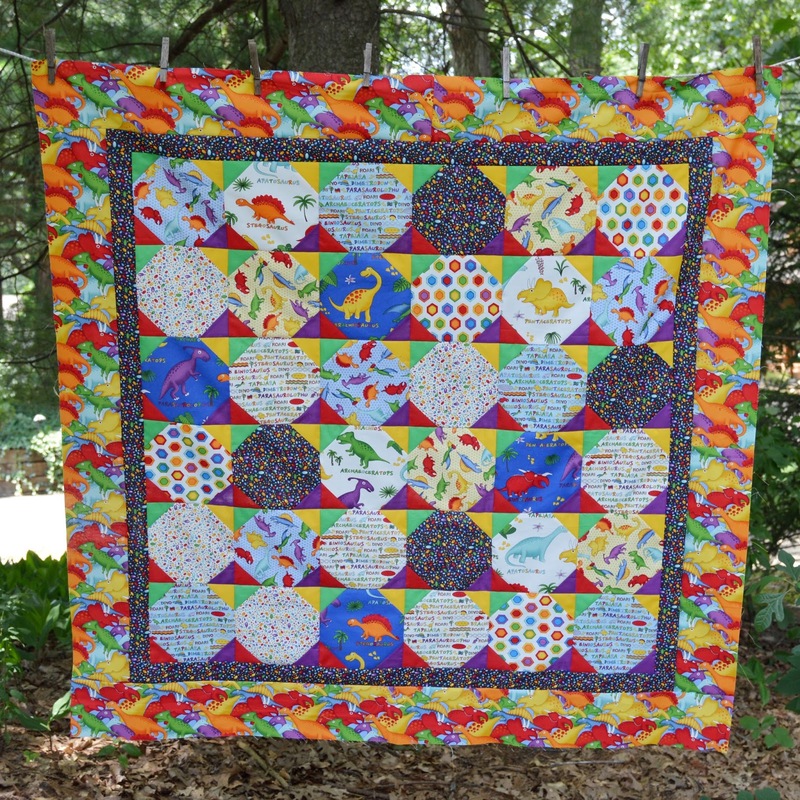 If you haven't seen this collection yet, check out our blog post here (and be sure to download the free twin-size quilt pattern--it's adorable!). Our tutorial today is a smaller quilt--just 47" square--that can be assembled quickly and easily. It's perfect for a new baby or toddler gift! 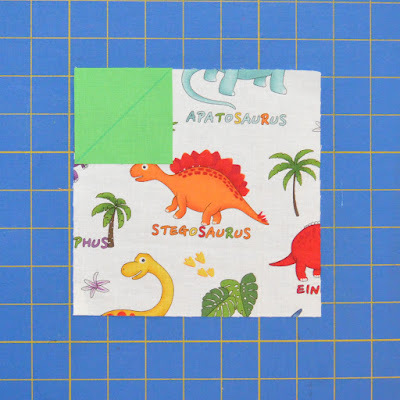 Note: Be sure to cut in this order--this allows the directional print to be oriented correctly in the border as shown in our quilt. Your cut squares will look like this...time to get started! Step 1: Draw a diagonal line on the wrong side of a green 2-1/2" square. 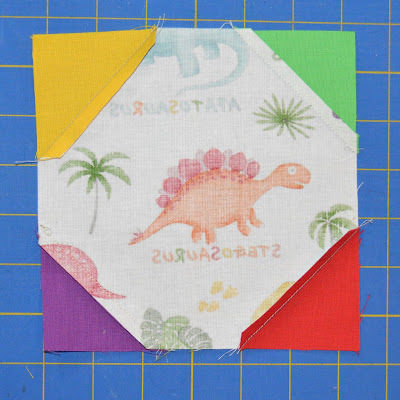 Position it on the upper left corner of a 6-1/2" dino square as shown. Step 2: Stitch on the drawn line, trim seam allowance to 1/4", and press open. Timesaver tip: If you don't want to draw lines on all of the 2-1/2" squares, you can position a piece of masking or painter's tape that aligns with your sewing machine needle. Then simply align the smaller square on the larger one, and position so the needle is touching the small square corner on one end, and so the opposite small square corner aligns with the tape edge. Stitch, keeping the small square corner aligned with the tape edge. No line drawing needed! Step 3: Repeat on remaining 3 corners, using a different color in each corner as shown. Note: When you press the corners open, press opposite corner seams in opposite directions (below, the yellow and red corners are pressed in toward the center, while the green and purple corners are pressed out toward the corner. This allows the seams to nest neatly when it's time to join the blocks. Step 4: Repeat to make a total of 36 blocks (4 of each dinosaur print). 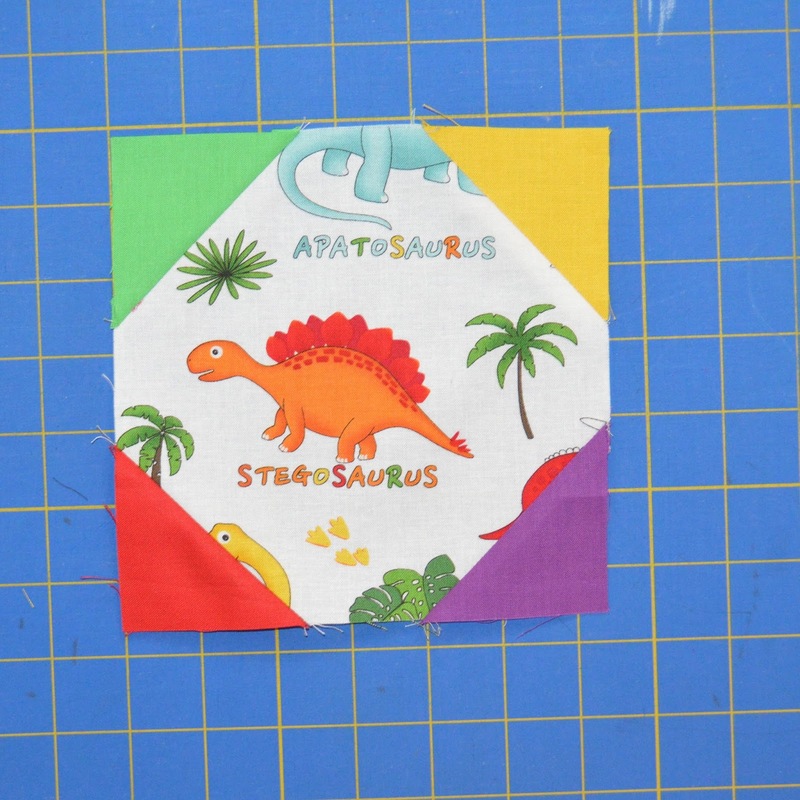 Make sure you sew on the solid corners in the same order for each block. Blocks should measure 6-1/2" square. Step 5: Lay out the blocks into 6 rows of 6 blocks each, noting orientation so the corner colors are in the same position for each block. Step 6: Sew the blocks into rows and join the rows to complete the quilt center. Step 7: Measure the length of the quilt center. Trim (2) 2" x 42" blue egg strips to that length and sew to the sides of the quilt. Measure the width of the quilt center, including the strips just added. Trim (2) 2" x 42" blue egg strips to that length and sew to the top and bottom of the quilt. 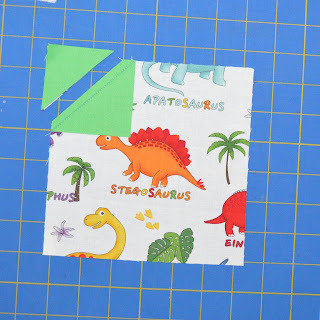 Step 8: Join the 4-1/2" x 36" dino strips (with dinos running vertically up the strip) short ends together into one long strip. Measure the length of the quilt and cut (2) strips to that length. 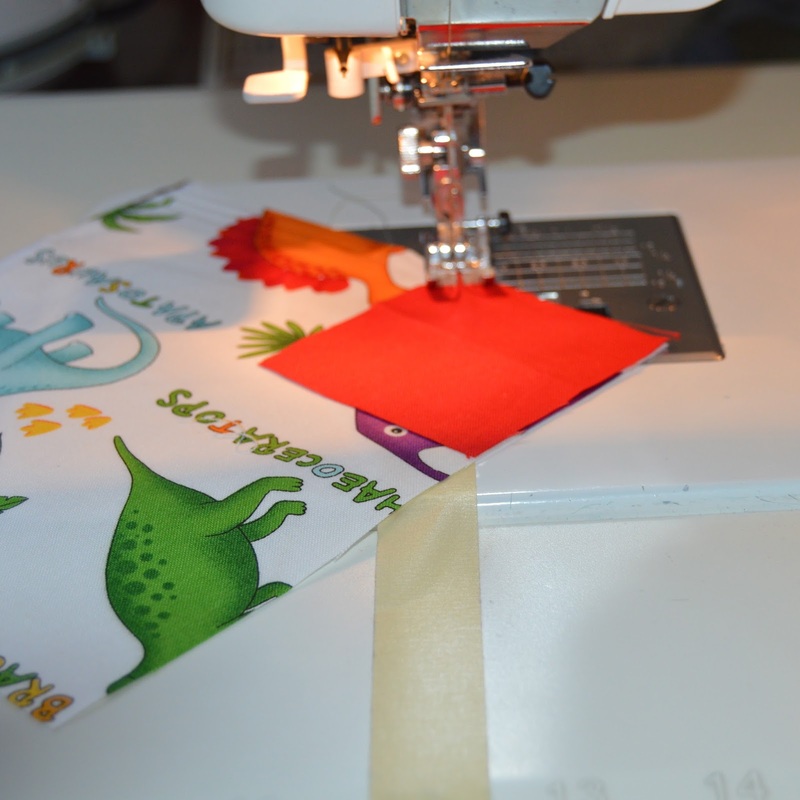 Sew to the sides of the quilt, making sure dinosaurs are right sides up. Sew the remaining 4-1/2" x 28"strips (with dinos running horizontally) together in pairs. Measure the width of the quilt, including the strips just added, and trim strips to that length. Sew to the top and bottom of the quilt, making sure dinosaurs are right sides up. Step 9: Layer the quilt back right side down, batting, and quilt top right side up. Quilt as desired. 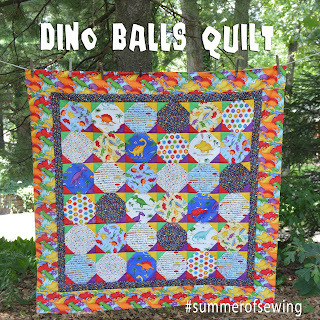 Trim layers even with the quilt top and use the (5) 2-1/4" x 42" blue dino egg strips to bind the quilt. We love the little diamond pops of color created by the solid corners on the snowball blocks! Would you like to win a bundle of Lost World fabrics? 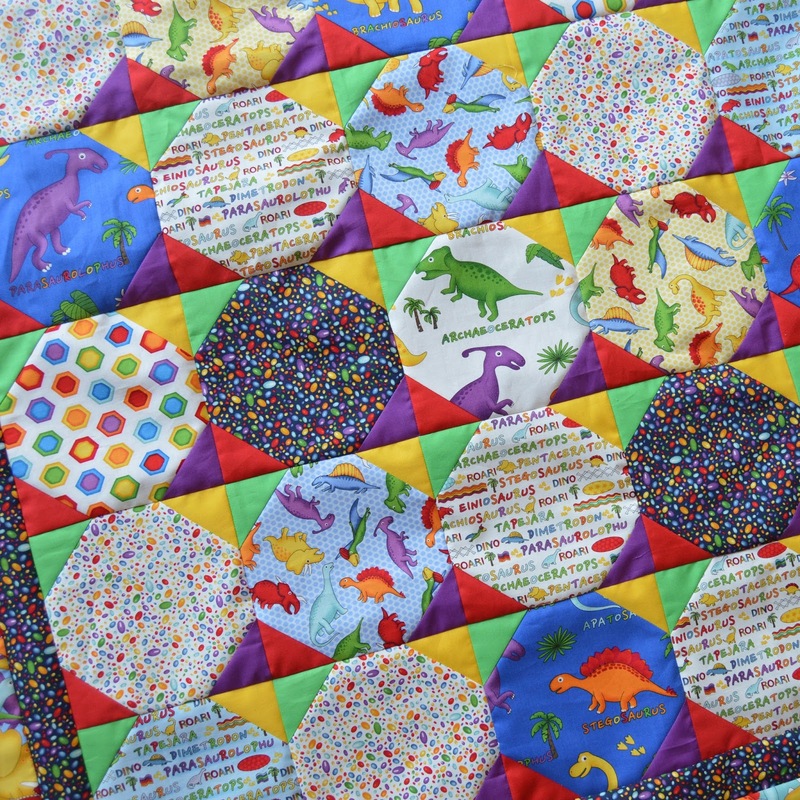 Leave a comment below (or on IG) telling us your favorite dinosaur (if you can't come up with one, take a peek at the fabrics--they even include dino names!). Giveaway is open through Sunday, July 23rd at 11:59 PM CDT. 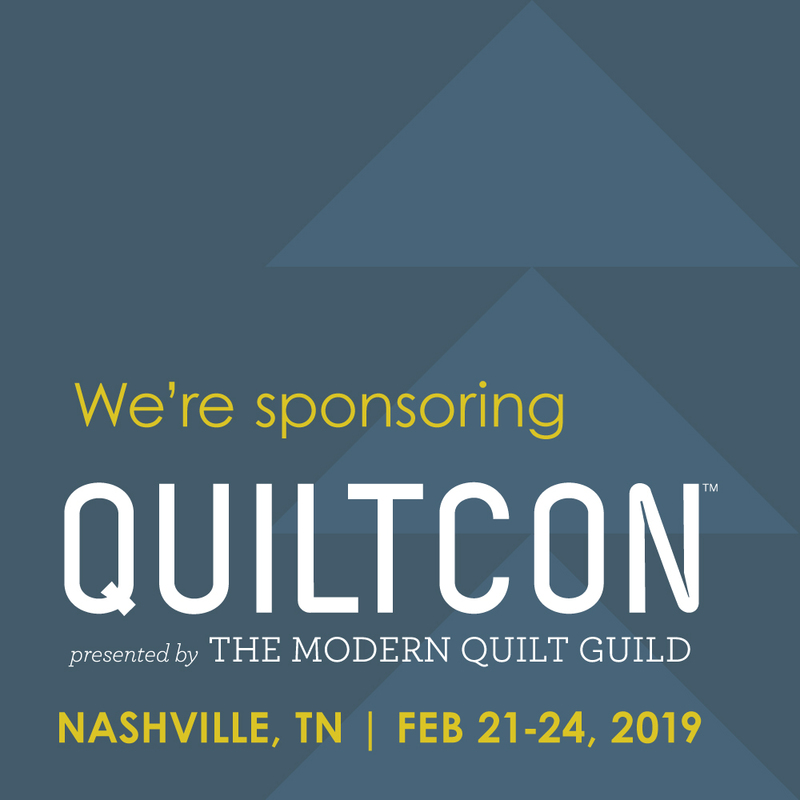 pssst....tac73, we don't have your email address to contact you, so please email us at fabriquiltblog (at) gmail.com. If we don't hear from you by Monday, July 24th, we'll choose a new winner. I really like the Parosaurolophus because of his/her appendage sticking out of the back of its head. It would be the perfect place to hang a hat, a bow, or a set of keys to the cave! My favourite is the Pentacerotops. He's adorable! My dinosaur loving preschooler always loved stegosaurus's so that's what I'll go with. These fabrics are so adorable. My grandchildren will love these. Thank you for the giveaway. Dinosaurus. So majestic. 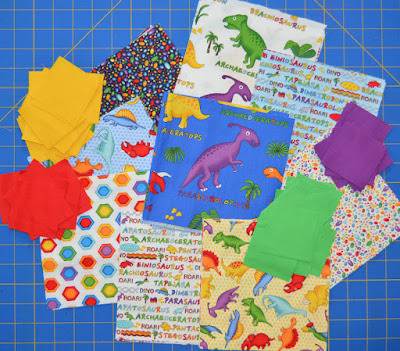 Fun fabric for any child, at any age. Ankylosaur. I love the shape and his l the defensive features. My son loved dinosaurs when he was young, I guess most little boys do. I'll pick Triceratops as my favorite. 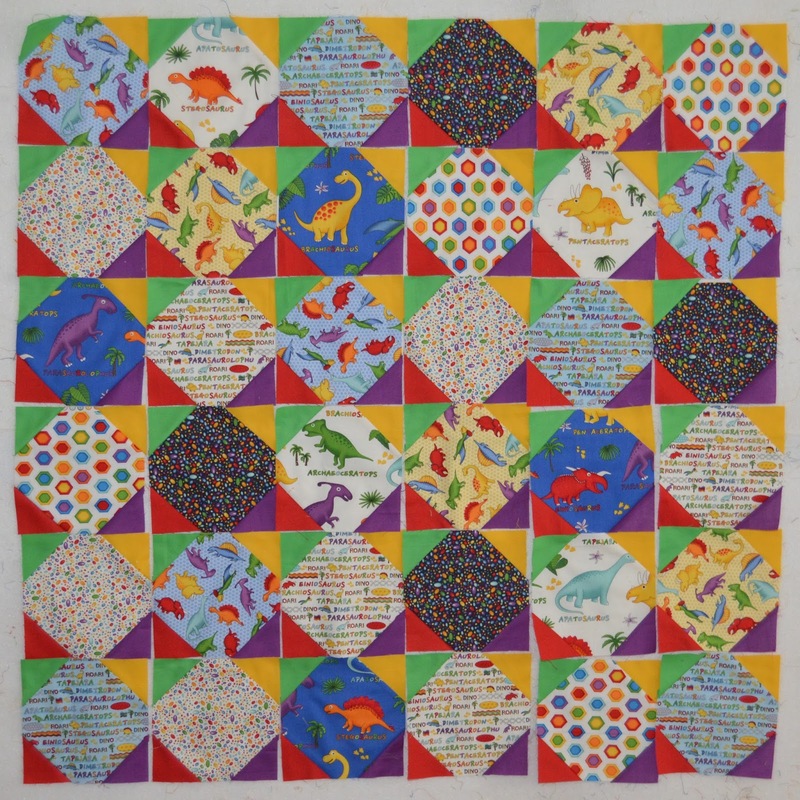 These fabrics are fun and love your quilt with the fussy.Parosaurolophus . Brontosaurus is my favorite dinosaur. After Dino, the Flintstones's dinosaur, what other dinosaur could I pick? My granddaughter said her favorite is the Brontosaurus. i have to agree with her. The collection is so sweet. I will have to choose Pentaceratops, he is just so adorable. 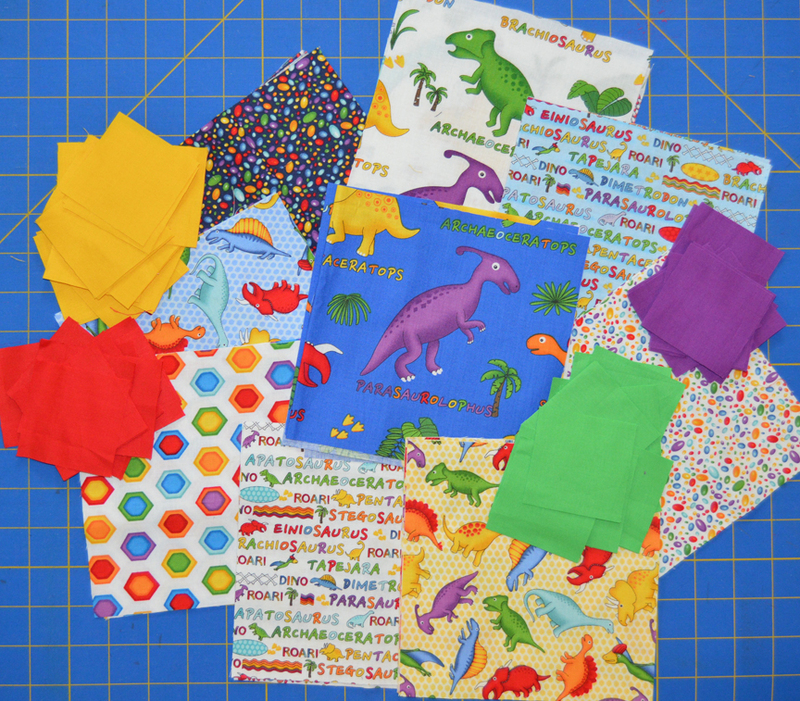 Yet, every dinosaur is so cute in this wonderful fabric line! Thank you for the fabulous tutorial! The purple Parasaurolophus is adorable and my fav. The stegosaurus is my favorite. All my grandsons have loved dinosaurs. My favorite dino is ptaradactile (spelled wrong ). The flying one. I always liked a Stegosaurus myself but my kids liked T-Rex. Pentacerotops- my favorite! love this cute line! My favorite is Stegosaurus. I love the look on his face. Thanks! My grandkids love the Dinosaur Train on PBS. Your colorful dinos are terrific. I especially like Triceratops. triceratops has always been my favorite!